Sydney Thunder can still qualify for the finals and after the Melbourne Stars' defeat on Friday, they are left knowing they have to win this match and then hope their Sydney neighbours can beat the Stars on Sunday if they are to reach the final four. 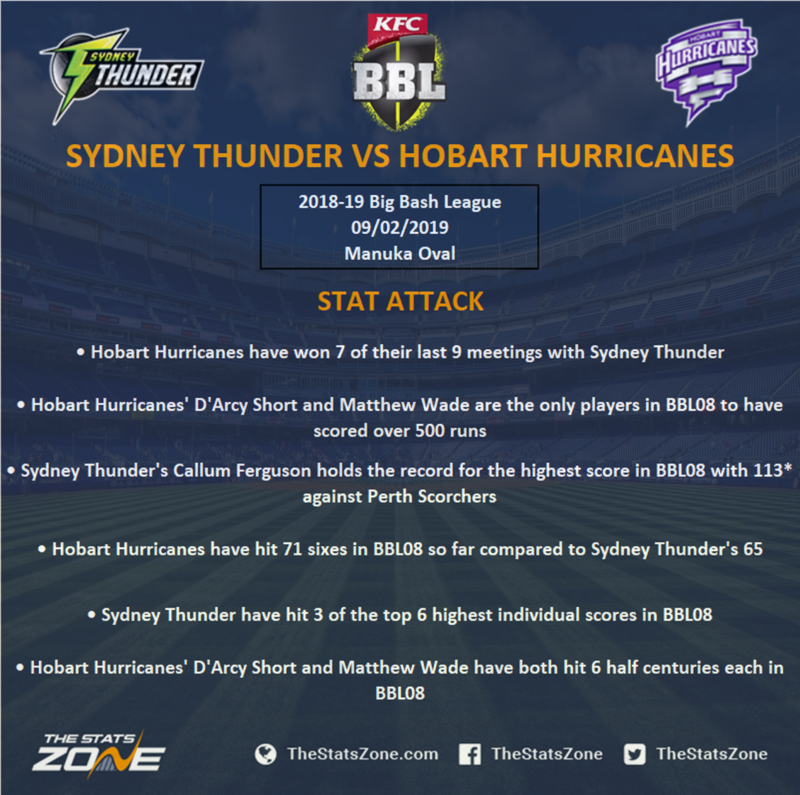 Thunder didn’t help their own cause in the last game as they suffered a heavy loss against Sydney Sixers with a nine-wickets under the D/L method seriously harming their chances although they are boosted by the return of their Australian Test players for this match. Usman Khawaja, Kurtis Patterson and Pat Cummins all come into the squad whilst Matt Gilkes is also back having overcome an injury with Jono Cook, Jason Sangha, Arjun Nair and Baxter Holt all making way with the 13-man squad looking the strongest it has been for a while. Hobart Hurricanes finally secured a home semi-final as well as ensuring they finished at the top of the BBL08 ladder as they defeated Melbourne Renegades by 16 runs in an entertaining encounter last time out. Matthew Wade set the tone for his side with a quick-fire 58 off just 30 balls as his side set the Renegades 184 to win and with a solid display from the bowling unit who were able to take fairly regular wickets, they got the job done in the crunch clash. The Hurricanes have decided to try and build some consistency ahead of their semi-final and will go into this game with the same squad which means James Faulkner is given extra time to recover from the knee injury that has previously kept him out. The return of Sydney Thunder’s Australian Test players to boost their ranks comes just at the right time as the Thunder know they have to win this match to put the pressure on Melbourne Stars on Sunday. This could be a blockbuster encounter with the Thunder going all out for the win that would pile the pressure on the Stars. The Hurricanes will have something to say about that and will be looking to build some consistency to their game ahead of their home semi-final which they secured last week. However, the Thunder can edge this one with motivation on their side to force the Stars to need to win on Sunday.